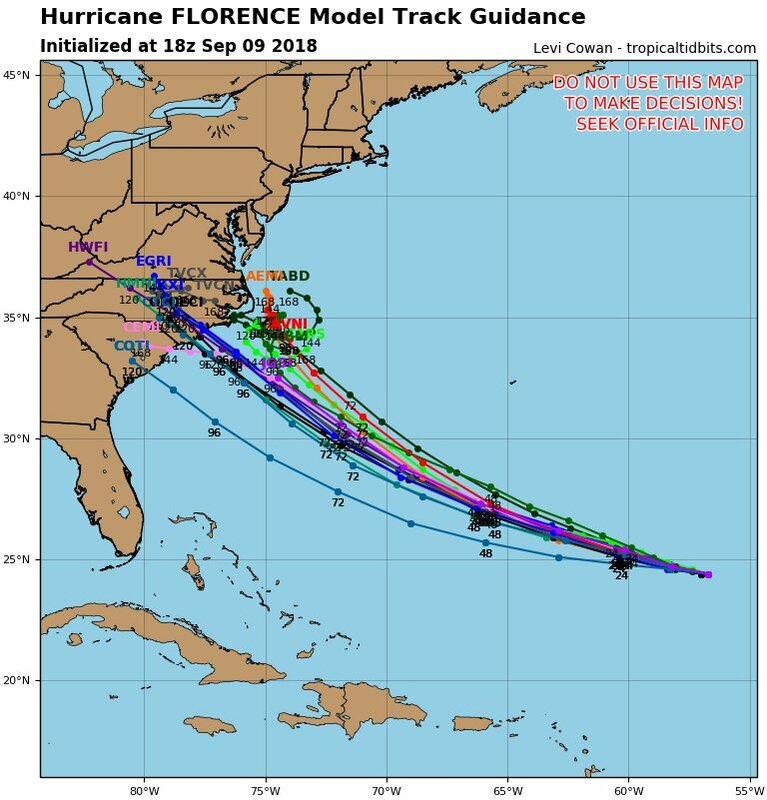 Tonight’s operational EURO model is trending further south and west with #HurricaneFlorence putting South Carolina into play. This storm oh so reminds me of #HurricaneHugo that I chased and manage to get into its eye in 1989 at Charleston. What a ride! 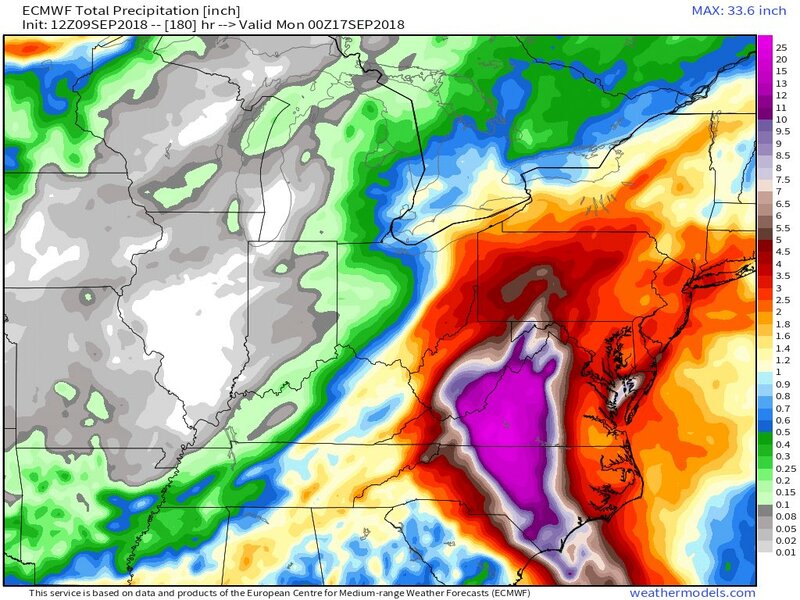 Models are coming into better agreement. 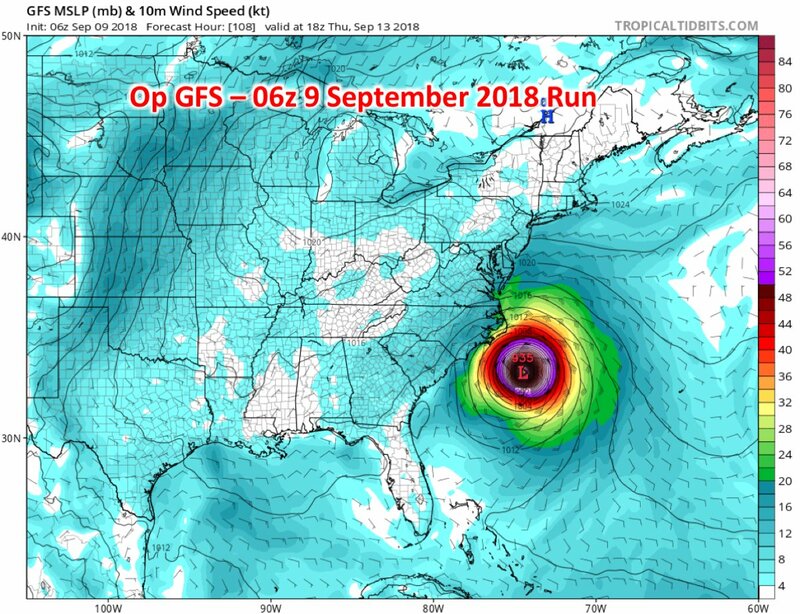 00Z MON GFS tracks cat 4 #Florence further south & inland than that of the 18Z GFS devastating eastern North Carolina and SE Virginia, then stalling inland. This run we have the #Harvey scenario of extreme #flooding at RDU up through ORF. As of the 00z #ATCF update, we now have three simultaneous #hurricanes in the #NATL basin. 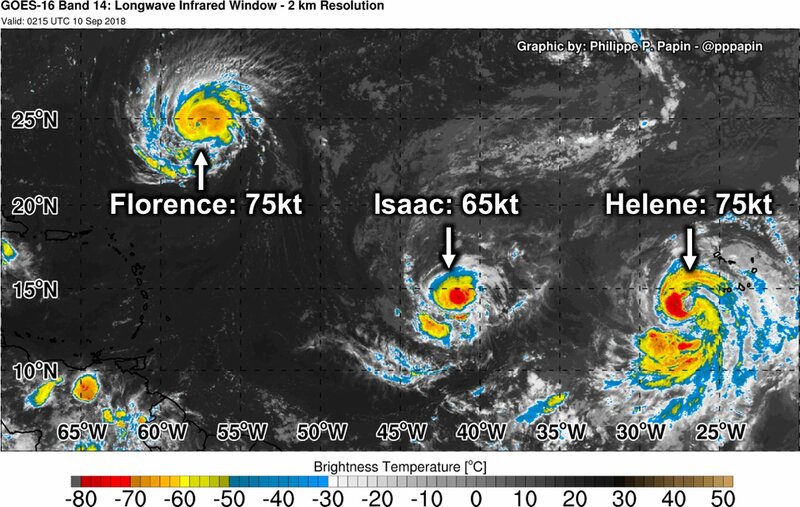 #Florence – 75kt, #Helene – 75kt, & #Issac – 65kt. 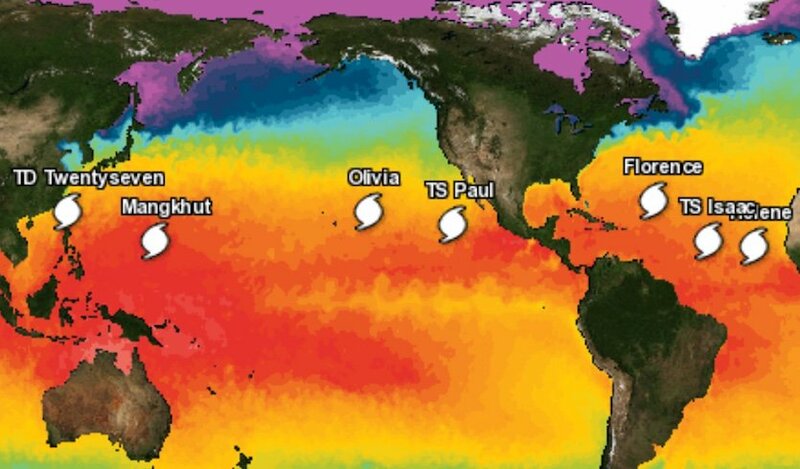 The last time we had three simultaneous hurricanes? 366 days ago (8 September 2017). Once again weather loves #DejaVu. 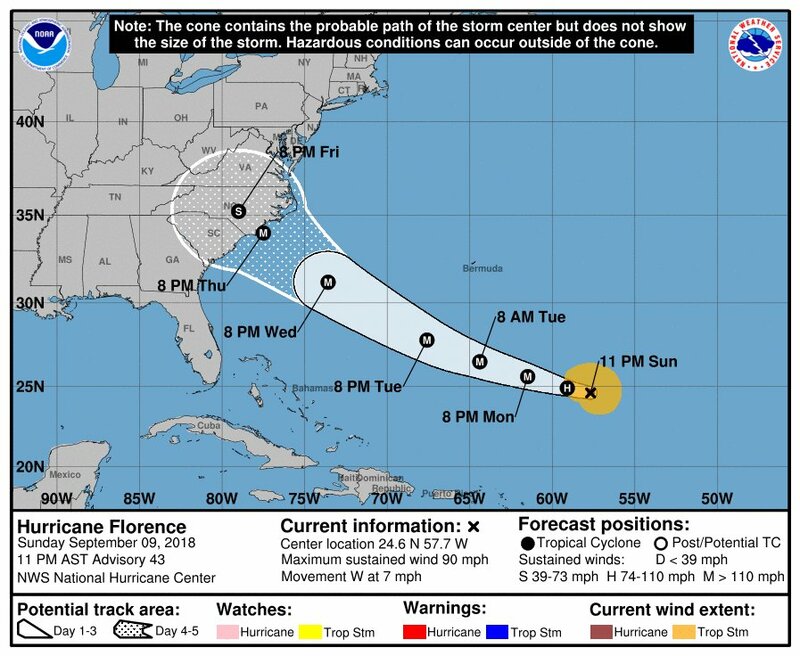 Remarkably solid agreement on the general path of #Florence. Models are coming into better agreement. 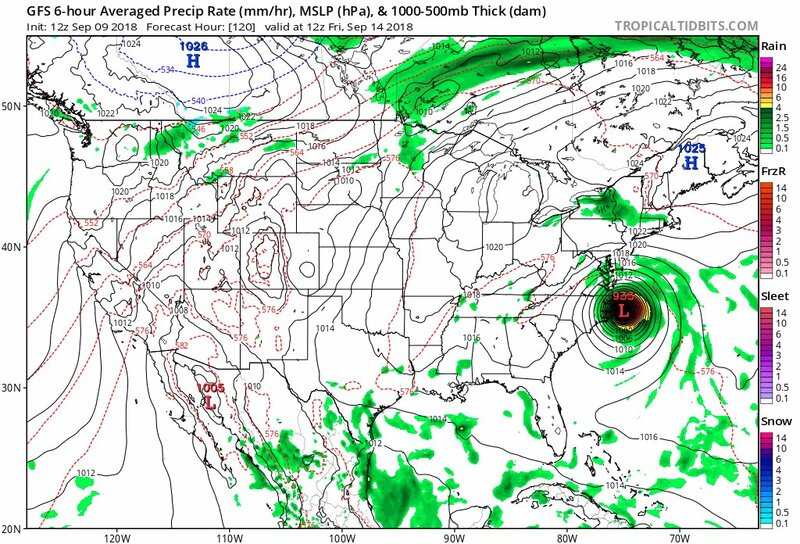 18Z SUN GFS tracks what looks like cat 4 #Florence further south and inland than that of 12Z GFS devastating the outer banks of eastern North Carolina before moving the system out to sea. Model scenarios will vary some through Monday. 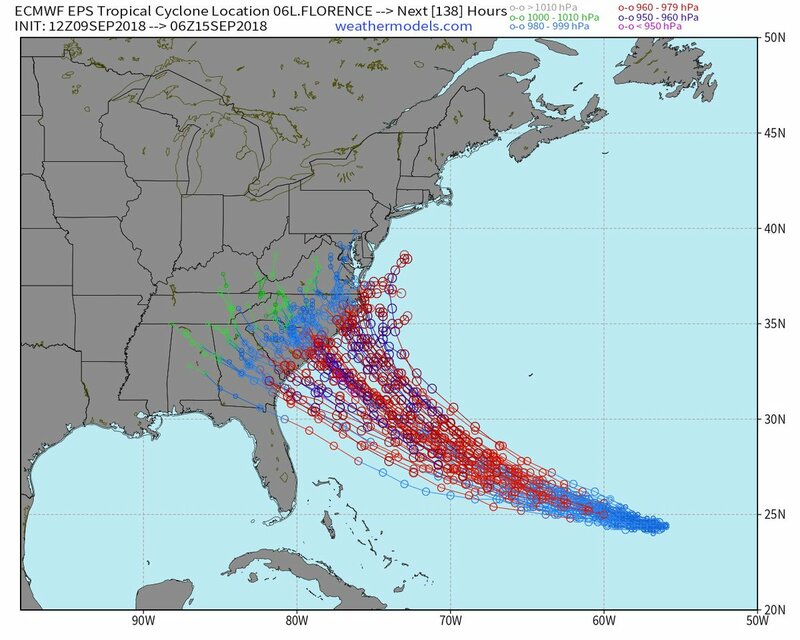 For analogs on Hurricane Florence, there isn’t one. This is in many ways a potential combination of Hurricane Hugo of 1989 for coastal impacts, with Harvey of 2017 for inland flooding. Seriously. 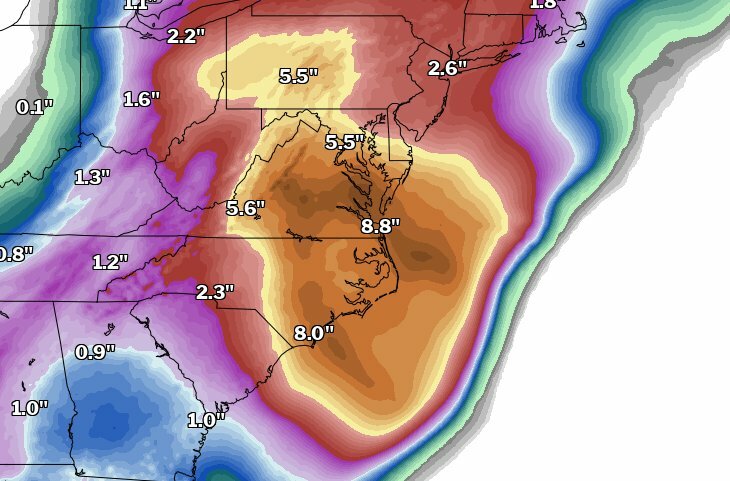 A tropical system hitting the Carolinas typically brings New England some rain. 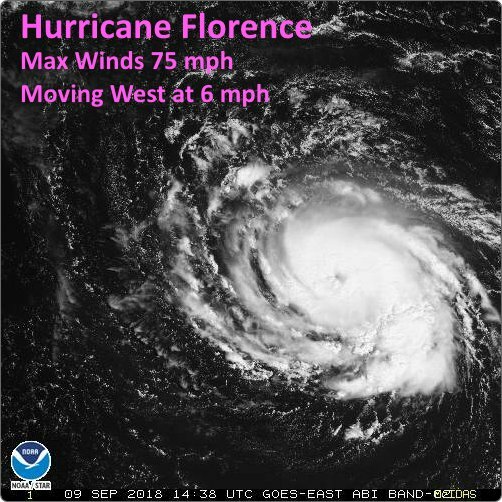 #Florence may not. 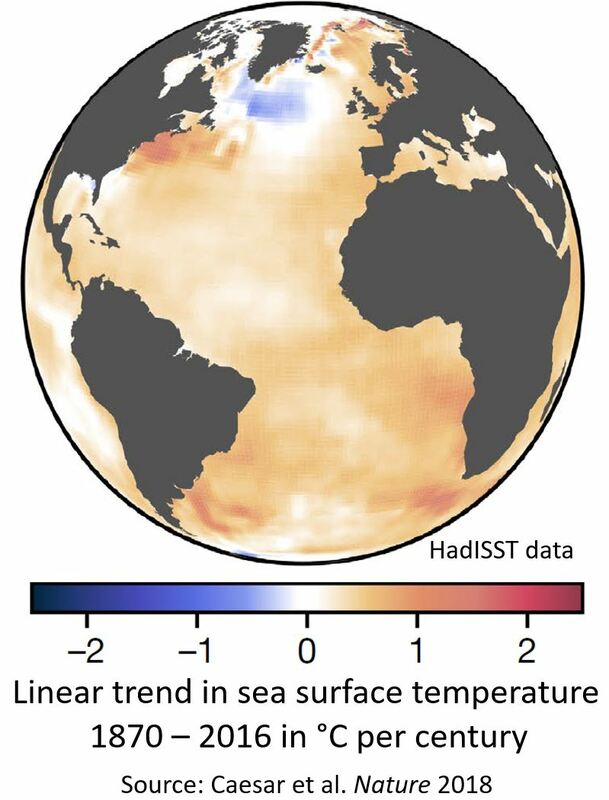 Instead, it may slow and stall, creating a major problem for the Mid-Atlantic. 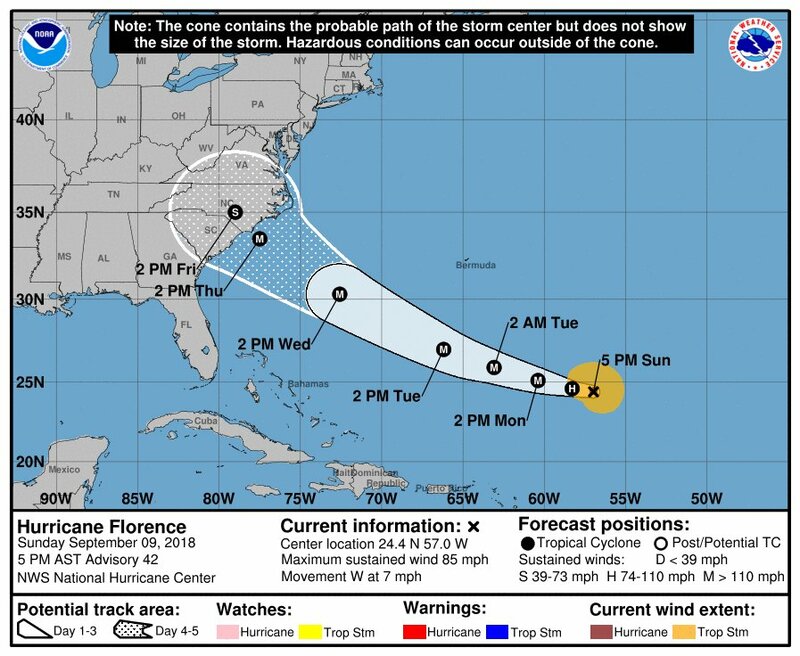 5 pm Sun Update…Hurricane Florence is a little stronger with max winds of 85 mph with rapid strengthening expected Monday. 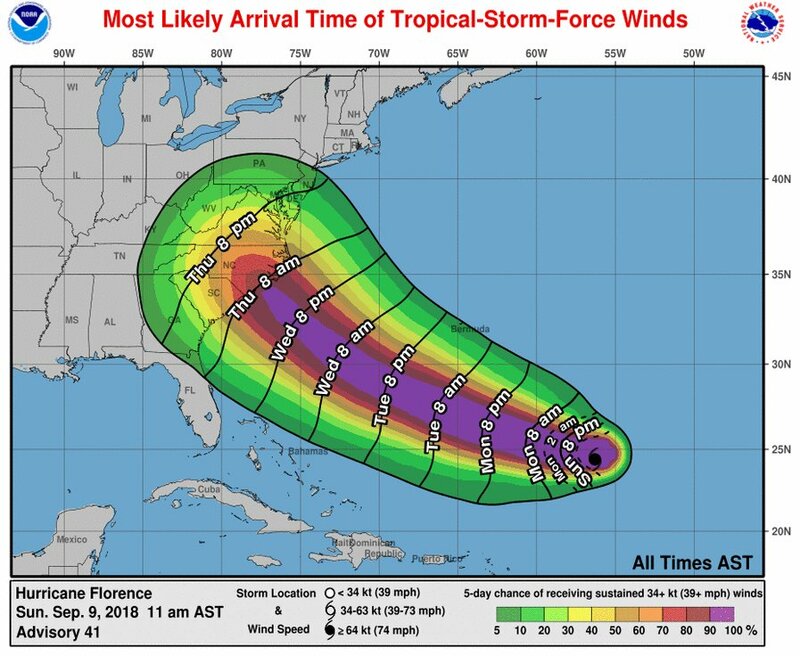 Remember the cone depicts the possible track of the storm center – not the area of impact. Hazardous conditions can occur outside of the cone. 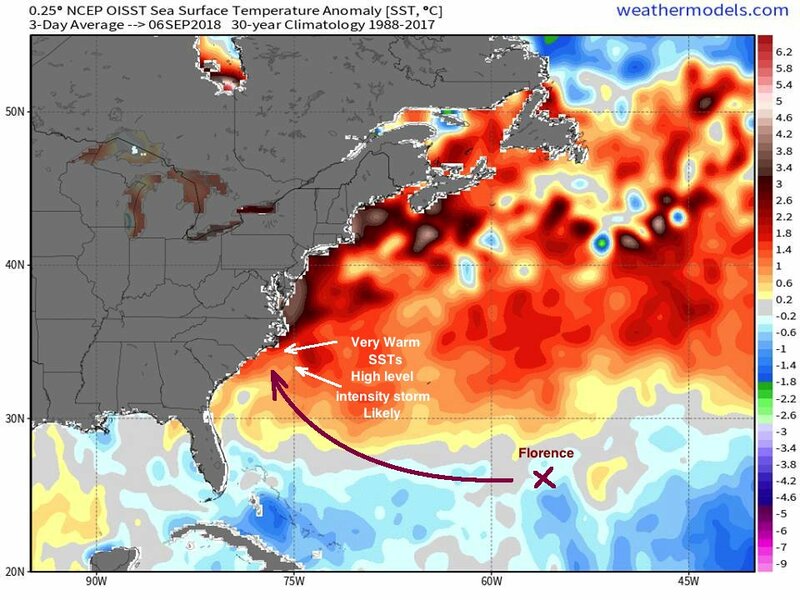 Current sea surface temperatures out ahead of #Florence are plenty warm to support an intense category 4 or even 5 hurricane at the storms peak. Very dangerous conditions in place for an approaching major hurricane. 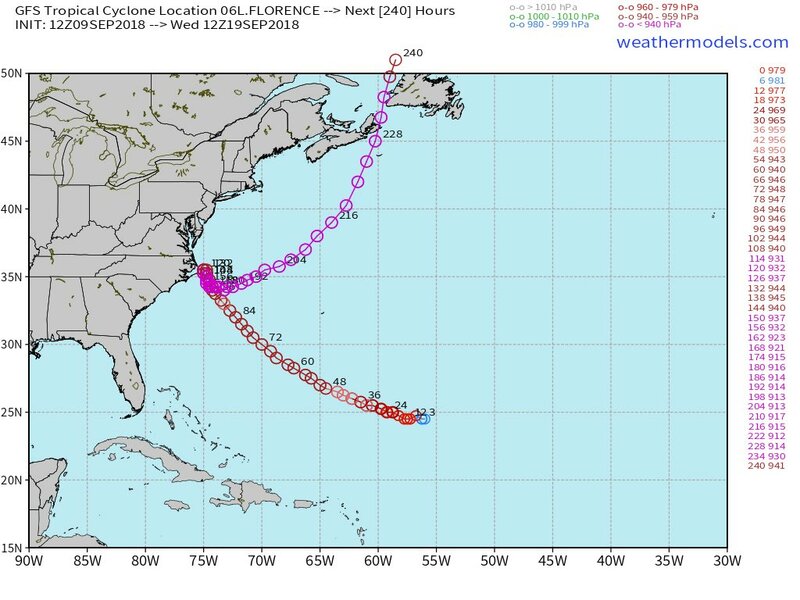 A quick look at PM EPS (ECMWF’s Ensemble Prediction System) forecast data shows that some uncertainty remains with regards to #Florence‘s track forecast. However, odds of a major hurricane landfall remain high. 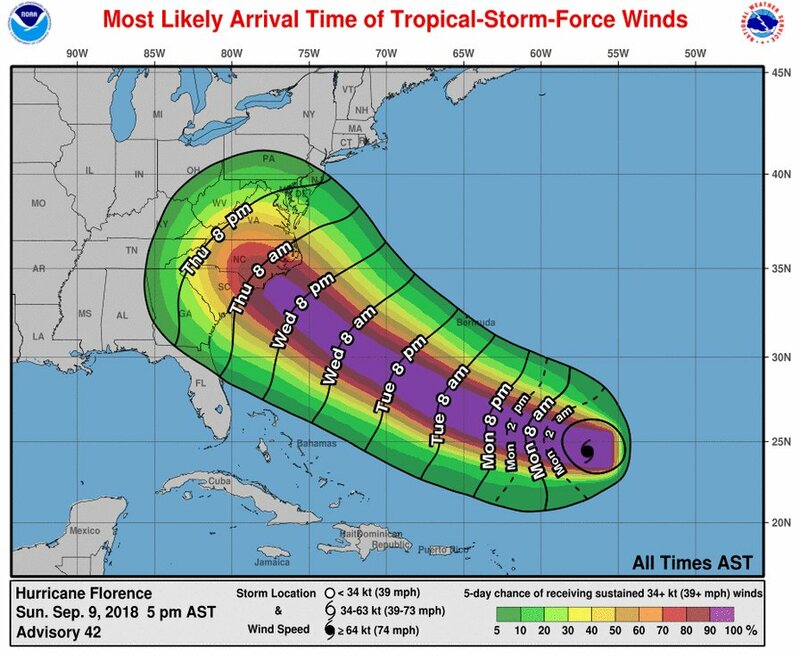 Residents of #NCwx #SCwx, and #VAwx should continue preparing! 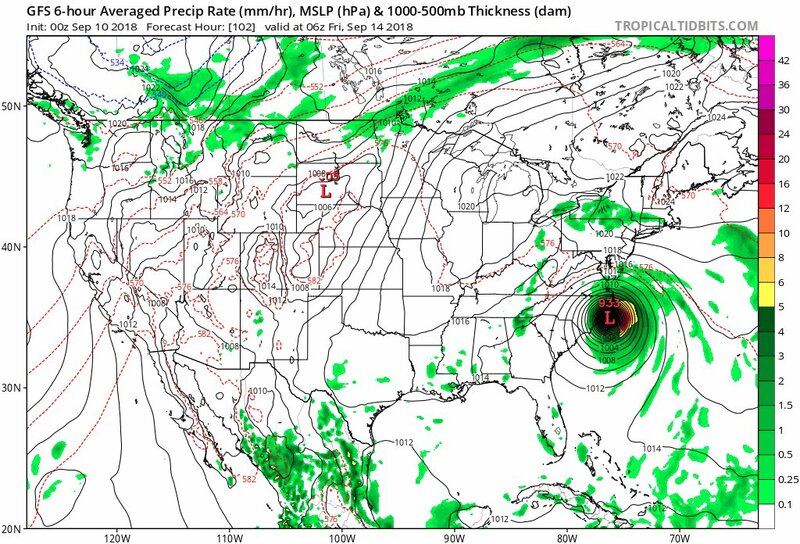 Very consistent with itself EURO model over the last few days continues to forecast a North Carolina landfall. The further south along the coast for a landfall the worse flooding and coastal destruction implications will be. 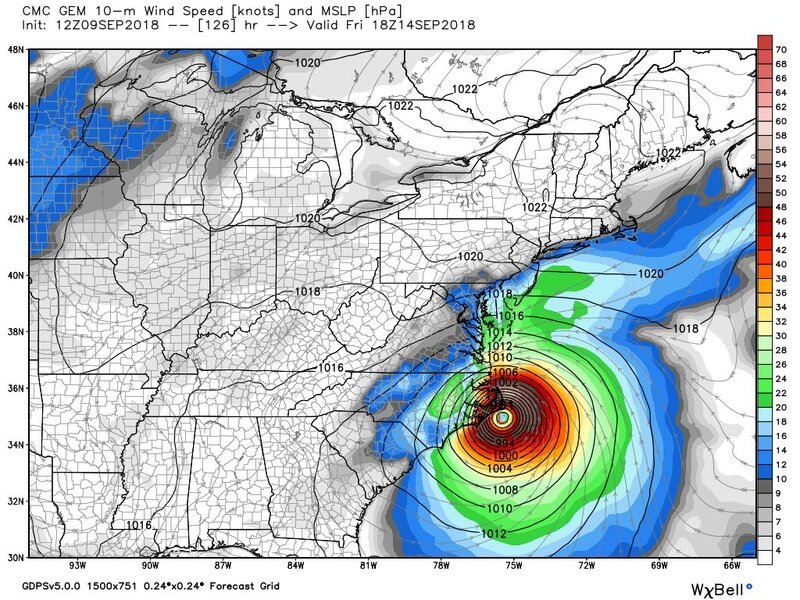 The 12Z SUN EURO has a landfall near Wilmington. 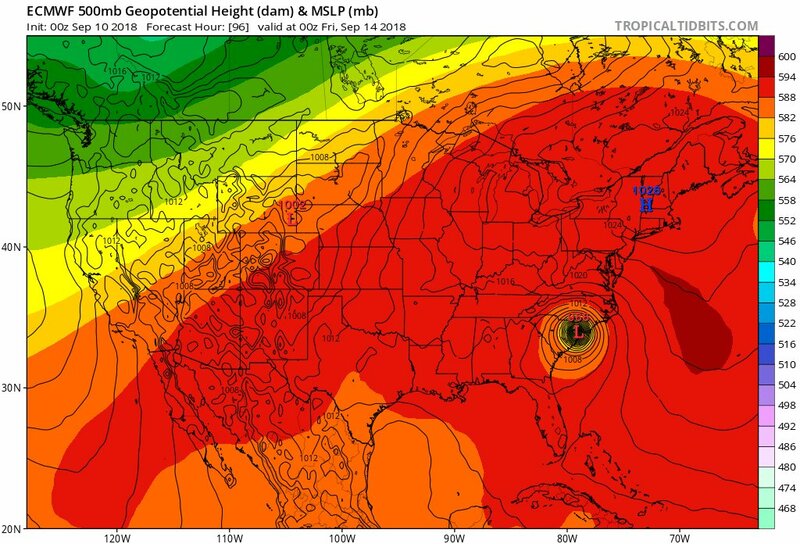 Here’s the full Euro track….much deeper inland and a stall that would deliver epic amounts of rain. 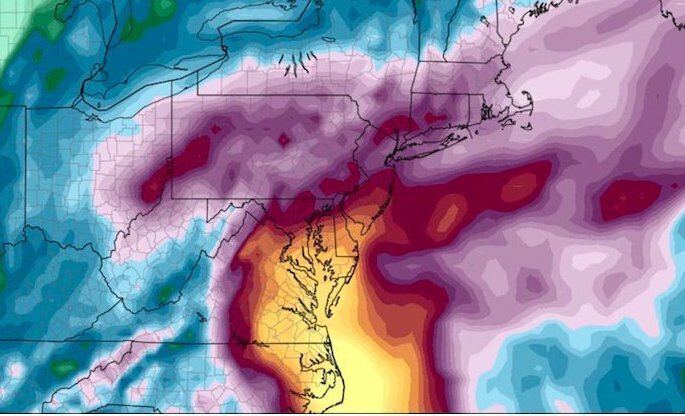 I mean widespread catastrophic flooding. This is awful if right. 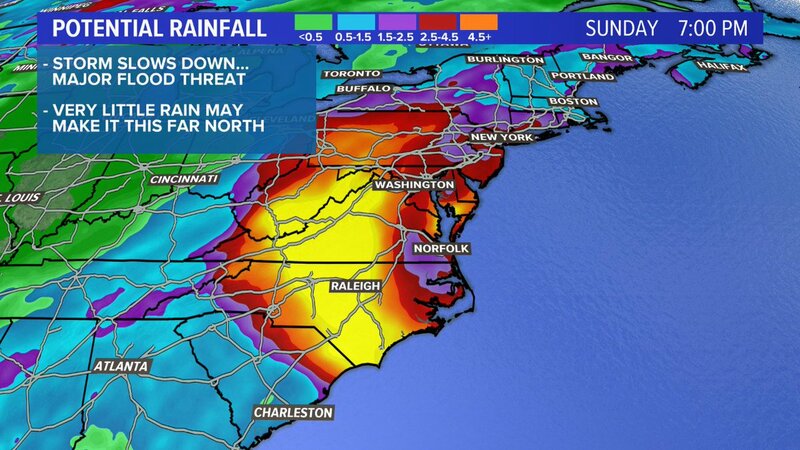 And that rain map is only though 180 hours – it’s still pouring out!! 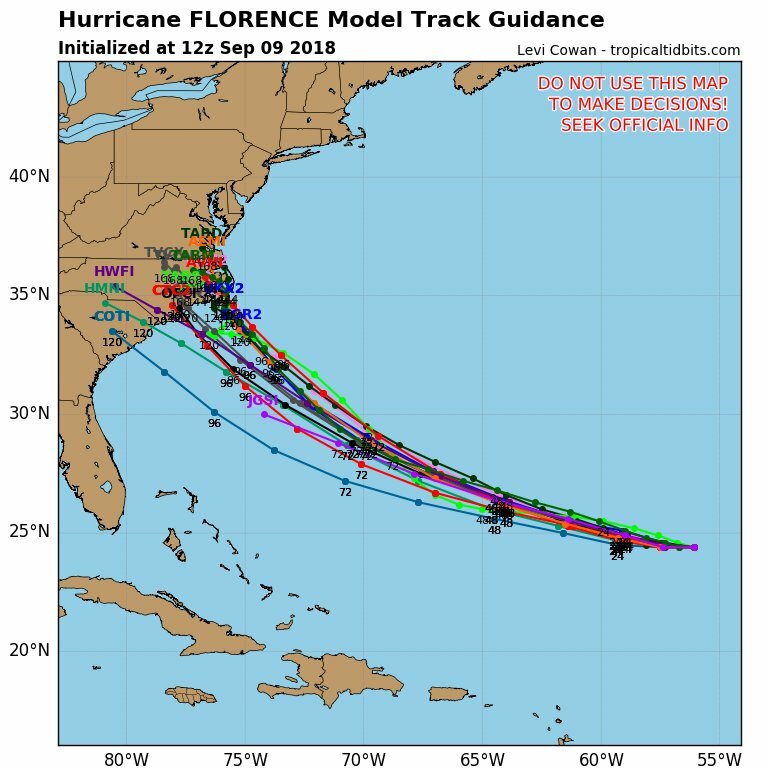 A word of warning: do *not* assume a spaghetti map properly depicts the uncertainty in #Florence‘s track. ATCF plots make it appear NC is the only state threatened. This is misleading if you don’t know the technical details. Listen to @NHC_Atlantic for official forecast always! 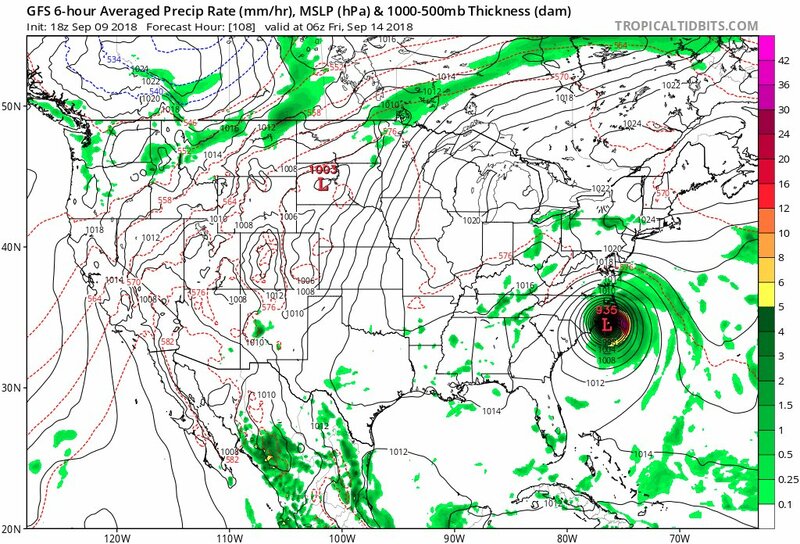 Midday GFS is brutal for the Outer Banks of NC. Canadian is similar too. 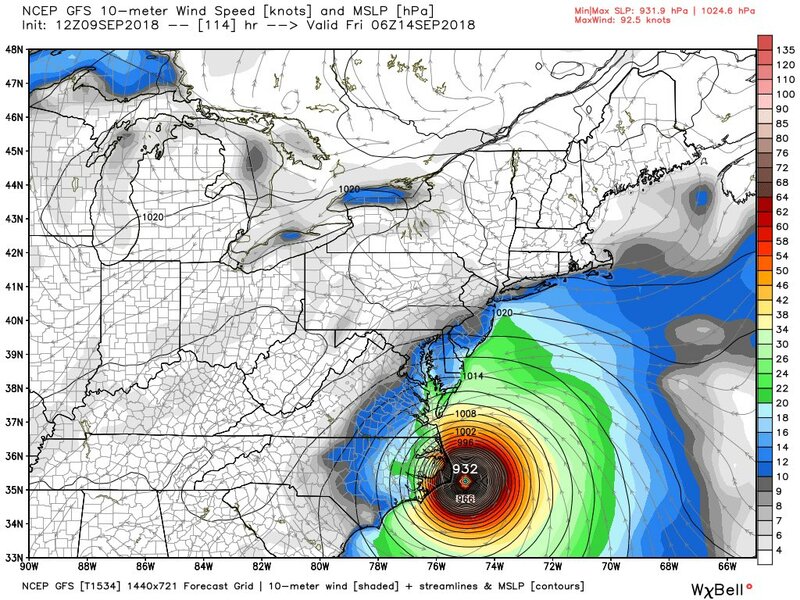 The 12Z SUN GFS tracks what looks like cat 4/5 #Florence further east than that of 06Z devastating the outer banks of eastern North Carolina before moving the system out to sea. Model scenarios will vary some through Monday, but the trend should be for better consensus. 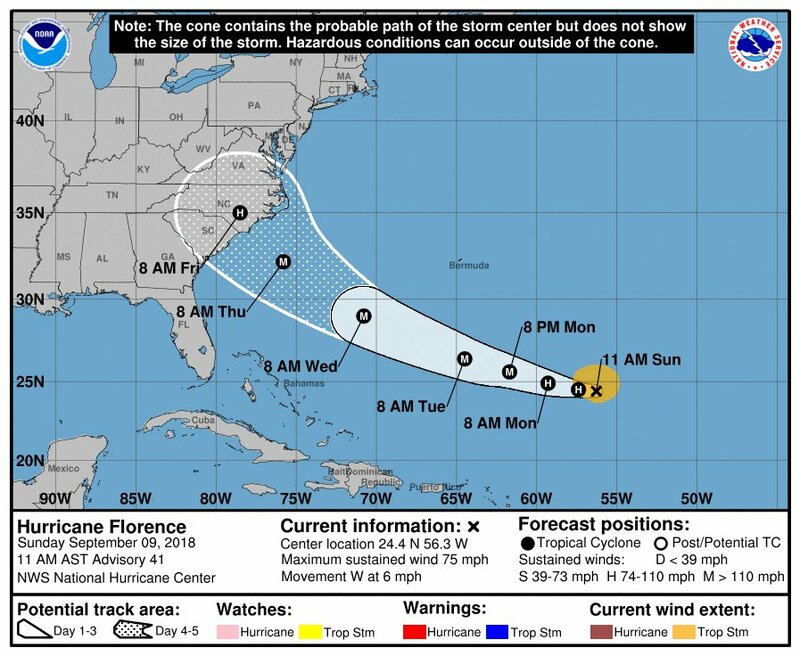 The first climate change shoe to drop is the unusual westward track for Florence in association with a system located where the system is in the Atlantic. We are still waiting for the other shoe…rapid intensification. 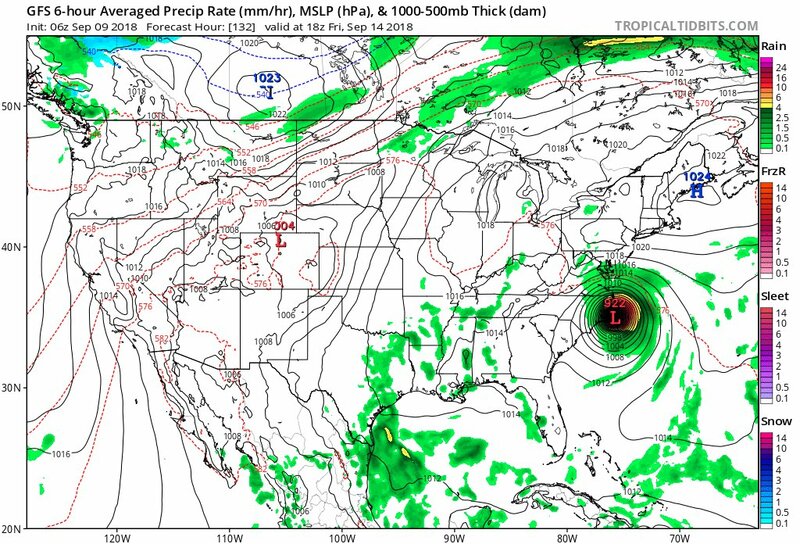 The 06Z SUN GFS tracks what looks like cat 4/5 #Florence further west than that of 00Z devastating eastern North Carolina and the Mid-Atlantic states before moving the system out to sea. Model scenarios will vary some through Monday, but the trend now is for better consensus. 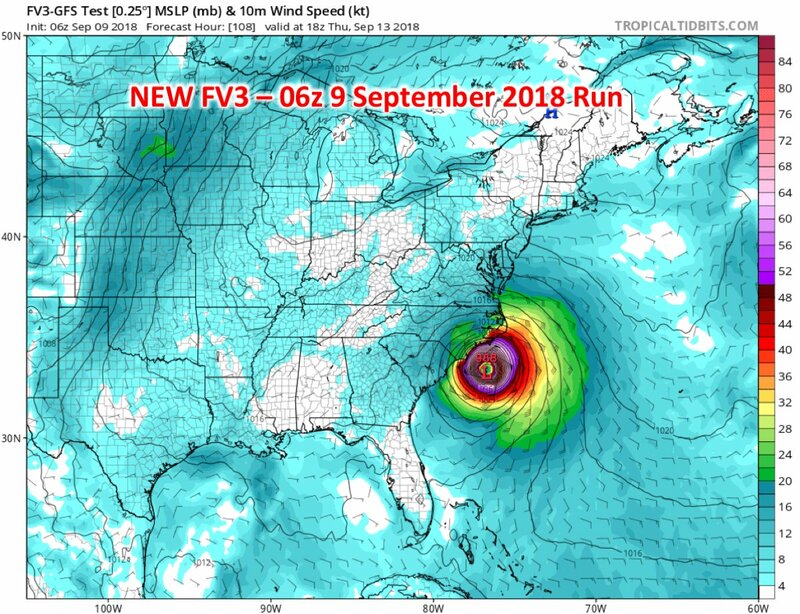 A lot have focused on the #Florence model battle b/w the ECMWF & GFS, but maybe the more important battle is to see how the new #FV3 performs vs. the #GFS. 06z runs were interesting because the #FV3 is weaker & further west compared to the op #GFS. 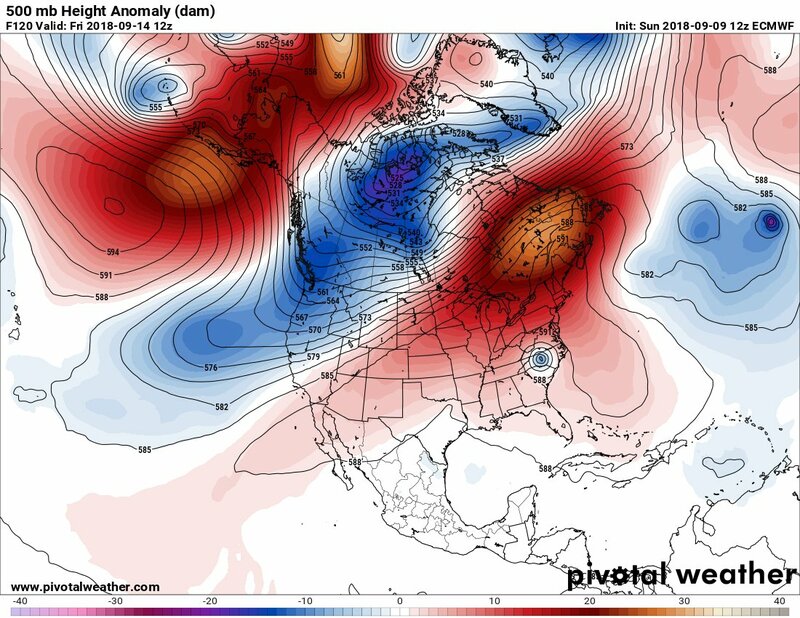 FV3 is similar to the ECMWF. 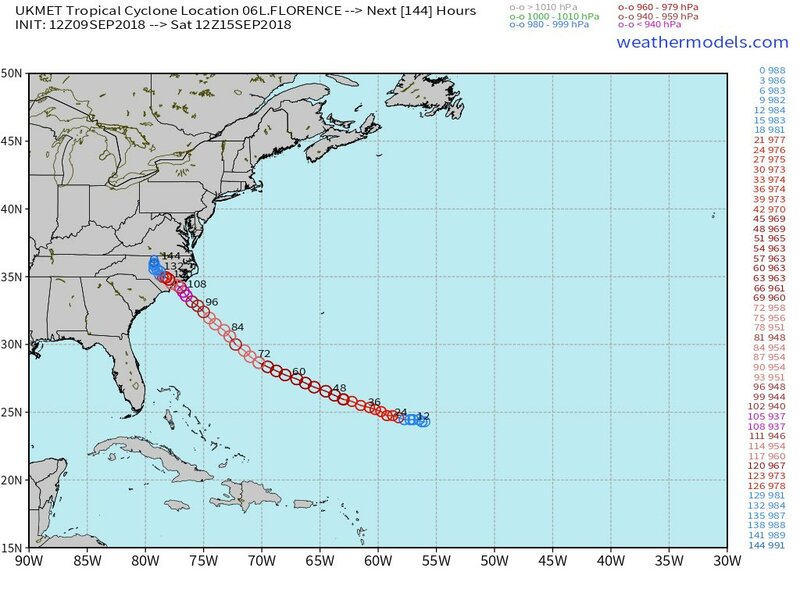 We're under 5 days from #Florence likely making landfall somewhere along the SE US coast. 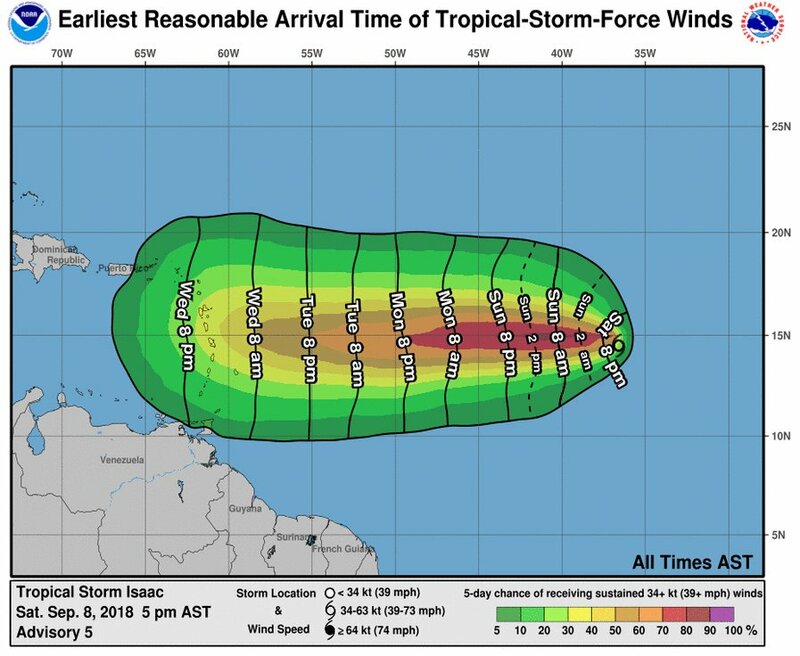 Amazingly, #Isaac is on a similar time frame as #Florence for when winds of tropical storm force could first arrive on land. About four days of prep time left in the Windward and Leeward Islands.